The growing demand for easy monetary transactions has helped the global mobile wallet market gain momentum over the last couple of years. The need to improve the security features of current transaction and payment techniques has triggered the deployment of near-field communication technology as a potential replacement for them. The primary drivers in the global mobile wallet market include the rising penetration of tablets and smartphones and the rising use of mobile internet. The proliferating use of smartphone applications is further expected to drive the global market for mobile wallet. Benefits of using mobile wallet, such as enhanced brand recall value, easy payment modes offered to clients, and flexibility in terms of time and location, are further anticipated to boost the market. The growing popularity of near-field communication technology among consumers across the globe and the expansion of the online shopping forum are expected to bode well for the mobile wallet market. However, concerns related to security breach and data vandalism are likely to act as deterrents in the growth of the market. The global mobile wallet market is estimated to witness strong growth over the forecast period. In 2015, the market stood at US$675.0 bn and is projected to be worth US$1,602.4 bn by the end of 2018. The retail segment is expected to emerge dominant among all the prime application segments including financial institutions, MNOs, payment network, customers, and intermediaries. It is expected that the retail segment will account for a share of 46.6% by 2018, closely followed by the vending machines segment. The growth of the retail segment can be attributed to the rising number of retail stores across the globe and the demand for convenient transactions. In terms of consumer type, card users are estimated to rake in a large share of the pie and rise to a valuation of US$793.2 bn by the end of the forecast period. Value-added benefits given to card holders by banks is anticipated to be one of the prime factors aiding the growth of this segment. In developed regions such as Western Europe and North America, the presence of traditional banking channels and the prevalence of mobile phones is almost equivalent. The penetration of smartphones in North America is above 50% and is projected to rise at a significant rate in the Asia Pacific region. However, the use of mobile phones for banking is comparatively higher than traditional banking methods in developing regions. The development of mobile banking is essential in these regions as extensive branch networks might not be an economically feasible option here. Mobile wallets enable consumers to efficiently manage their bank accounts virtually and avail services at affordable rates. The mounting adoption of smartphones and mobile internet in Europe, the Middle East, and Africa (EMEA) is likely to help the region surge ahead in the global mobile wallet market. The prime driver in the mobile wallet market in the EMEA is the growing partnership among mobile operators. The nature of the global mobile wallet vendor landscape is extremely consolidated in nature and is dominated by a few leading players. Companies such as ISIS (Softcard), Google Wallet, and Paypal together held a share of 70.0% in 2012 in the market. The growth of the market is expected to be augmented by the increasing number of strategic partnerships among competitors. Other prominent companies are LeveIUP, Amazon, V.me, and Payments. The mobile wallet market has gained momentum in recent years owing to the ease of use of the technology. In the recent years, mobile payments technologies such as near field communication (NFC) have emerged as a strong replacement for the current payment and transaction techniques owing to improvement in security features. The key stakeholders in mobile wallet market include banks/financial institutions, card operators, value added services (VAS) providers, device manufacturers, application platforms, mobile network operators, merchants/retailers, operating system providers, legal authorities and users. Industry participants are developing the infrastructure and there is increase in collaboration across the value chain including the technology vendors, payment service providers and the banks and credit card companies. 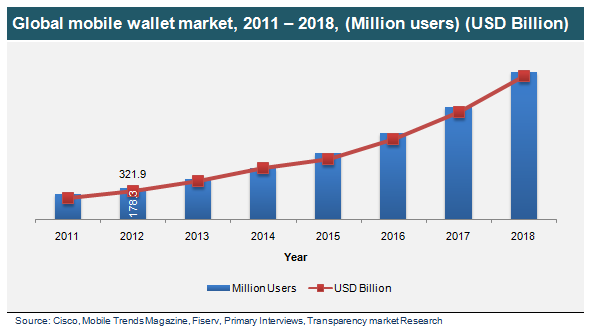 The increasing mobile data usage and growing penetration of smartphones and associated applications are some important factors driving the growth of mobile wallet market. Smartphone and associated applications are the basic requirement for the mobile wallet technology that enables payment without using traditional banking channels. The growing smartphones market is eventually resulting in the growing share of mobile wallet industry, globally. In developed economies such as North America, smartphone penetration is over 50% and is increasing rapidly in Asia Pacific. Rise in the mobile data usage is equally contributing to the growth of mobile wallet market. Mobile transactions require data connection to make payments. Retailers or merchants present in the supply chain also provide benefits to consumers, which can be availed only using an active data connection. In the developed economies of North America and Western Europe the penetration of mobile phones and traditional banking channels are comparable. However, in the emerging economies mobile phone penetration is significantly higher as compared to traditional banking. Technology in the form of mobile banking is essential for these markets, as extensive branch networks may not be economically viable in regions with poor infrastructure. Mobile wallets can serve the dual purpose of complete financial management, as well as remittance services. Mobile wallet provides banking services at affordable prices and helps consumers in managing their accounts. As a result of this, mobile wallet industry is witnessing an up boost in its revenue. Government bodies are also encouraging the adoption of mobile wallet services due to its increased benefits and numerous advantages. Mobile wallets are customizable and can be used for identifying the credentials of the consumers. Personal identification documents such as driving license, passport, and social security numbers can be verified with the help of mobile wallet. It is important to verify the credentials of customers when they make online payment activities. Mobile wallet facility can be integrated with the authentication programs to serve dual purpose of authentication and mobile payment. Initiative from government to encourage the use of mobile wallet is gaining momentum in emerging markets such as Philippines and Kenya due to the larger gap between bank and non-bank organizations. Financial inclusion is the crucial factor to reduce this gap which can be accomplished by agreement between governments, telecom companies and financial organizations. The report study on global mobile wallet market analyzes this market based on the major component types, application areas, functionality, consumer type, and major geographies. The major geographies covered include North America, EMEA (Europe, Middle East and Africa), and Asia Pacific. The report provides complete analysis of the factors responsible for driving the restraining the global mobile wallet market. PayPal is leading the global mobile wallet market, contributing for almost half of the total market share. Google wallet is another important player in mobile wallet market, contributing for one third of the share held by PayPal. Other important players in mobile wallet market include V.me, Amazon Payments, LevelUp, ISIS, and others.